Kyle Quinn in his lab at the University of Arkansas. FAYETTEVILLE, Ark. 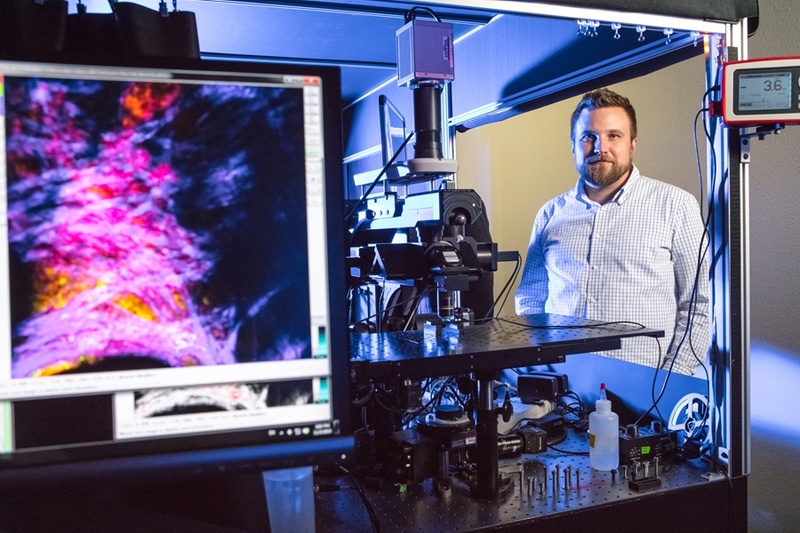 – Researchers at the University of Arkansas have developed a new approach to diagnosing and monitoring chronic skin wounds, such as diabetic foot ulcers and pressure wounds. About the College of Engineering: The University of Arkansas College of Engineering is the largest engineering program in the state of Arkansas. Over the past decade, the college has experienced unprecedented growth. Undergraduate enrollment has doubled since 2007, and total enrollment in the college is now over 4,000 students. The College of Engineering offers graduate and undergraduate degrees in nine engineering fields, as well as incorporating distance learning and interdisciplinary programs. Faculty in the college conduct research in many key areas, including electronics, energy, biomedical and healthcare engineering, materials science, transportation and logistics.